به‌منظور مطالعه‌ اثر وزن‌های مختلف بنه‌ مادری و عمق کاشت بر عملکرد گل و بنه‌ زعفران (Crocus sativus L.)، آزمایشی در دو سال زراعی 95-94 و 96-95 در مزرعه تحقیقاتی دانشکده کشاورزی دانشگاه فردوسی مشهد، به‌صورت فاکتوریل بر پایه طرح بلوک‌های کامل تصادفی اجرا شد. تیمارهای آزمایش شامل وزن‌های مختلف بنه مادری در چهار سطح 6-4، 8-1/6، 10-1/8 و 12-1/10 گرم و عمق کاشت بنه در سه سطح 10، 15 و 20 سانتی‌متر از سطح خاک بود. در سال اول عملکرد گل و بنه زعفران مورد بررسی قرار گرفت و در سال دوم فقط عملکرد گل زعفران ثبت شد. نتایج آزمایش در هر دو سال نشان داد که اثر متقابل وزن بنه مادری و عمق کاشت بر اکثر صفات گل معنی‌دار بود. با توجه به نتایج، افزایش وزن بنه مادری و عمق کاشت باعث افزایش عملکرد گل، خامه وکلاله زعفران شد. بیش‌ترین عملکرد کلاله‌ خشک در سال اول و دوم )به ترتیب با میانگین 10/0 و 53/0 گرم در مترمربع( در تیمار وزن بنه 12-1/10 گرم و عمق کاشت 20 سانتی‌متر به دست آمد که نسبت به شاهد (وزن بنه 8-1/6 گرم و عمق کاشت 20 سانتی‌متر) به­ترتیب 86 و 35 درصد افزایش نشان داد. اثر متقابل تیمارها بر عملکرد بنه‌های دختری معنی‌دار نبود اما اثر ساده‌ی هر یک از این تیمارها تأثیر معنی‌داری بر این صفت داشتند. بیش‌ترین عملکرد بنه با میانگین 60/1181 گرم در مترمربع مربوط به تیمار وزن بنه 12-1/10 گرم بود و در بین تیمارهای عمق کاشت این مقدار با میانگین 96/938 گرم متعلق به عمق کاشت 20 سانتی‌متر بود. در نهایت با توجه به برتری محسوس عملکرد در تیمارهای وزن بنه و عمق کاشت بالاتر در این طرح، جهت زراعت زعفران بنه­هایی با گروه وزنی بالاتر و عمق کاشت عمیق تر توصیه گردید. In order to study the effects of different weights of mother corm and sowing depth on flower and corm yield of saffron (Crocus sativus L.), an experiment was conducted as a factorial layout based on complete randomized block design with three replications at the Agricultural Research Station, Faculty of Agriculture, Ferdowsi University of Mashhad, Iran during 2015-2016 growing seasons. The experimental treatments were all combination of four mother corm weights (4-6, 6.1-8, 8.1-10 and 10.1-12 g) and three planting depths (10, 15 and 20 cm). In the first year, criteria such as flower and corms yield were evaluated, and in the second year only flower yield were recorded. The result revealed that in both years the interaction between corm weight and planting depths was significant on most traits of the studied flower. Flower, stigma and style yield significantly increased by increasing corm weight and planting depth. The maximum dry stigma yield was obtained in 10.1-12 g corm weight and 20 cm planting depth which was 0.1095 and 0.5393 g.m-2 in the first and the second year, respectively. The interaction between treatments was not significant on daughter corm but the individual effects of each treatment was significant. The higher corm yield (1181.6 g.m-2) was related to 10.1-12 g corm weight treatment. Deeper planting (20 cm) produced the high corm yield (938.86 g.m-2). Eventually, the high excellence of yield in corm weight and planting depth treatments of higher, we recommend corms with higher weight and deeper sowing depth for cultivating saffron. Abrishamchi, P. 2003. Investigation about some biochemical changes related to breaking of dormancy and flower formation in Crocus sativus L. 3rd National Symposium on Saffron. 2-3 December 2003, Mashhad, Iran. (In Persian). Abrishami, M.H. 1997. Iranian Saffron: Historic, Cultural and Agronomic Prospects. Astan Ghods Razavi Publishing Co. (In Persian). Ajaz, A.S., and Raj, B. 2008. Improved technology of saffron cultivation in Kashmir. Asian Journal of Horticulture 3 (2): 446-448. All, G., Igbal, A.M., Nehvi, F.A., Samad, S.S., Nagoo, Sh., Naseer, S., and Dar, N.A. 2013. Prospects of clonal selection for enhancing productivity in saffron (Crocus sativus L.). African Journal of Agricultural Research 8: 460-467. Alipoor Miandehi, Z., Mahmodi, S., Behdani, M.A., and Sayyari, M.H. 2014. Effect of manure, bio- and chemical- fertilizers and corm size on saffron (Crocus sativus L.) yield and yield components. Journal of Saffron Research 1 (2): 73-84. Alvarezorti, M., Gomez Gomez, L., Rubio, A., Escriban pardo, J., Jimenez, F., and Fernandez, J.A. 2004. Development and gene expression in saffron corms. Acta Horticulturae 650: 141-148. Azizi, A., Kamgar-Haghighi, A.A., and Sepaskhah, A.R. 2008. Crop and pan coefficients for saffron in a semi- arid region of Iran. Journal of Arid Environments 72: 270- 278. Benabaji, M.H., Mokhtarian, A., and Tavakoli Kakhki, H.R. 2012. The effects of plant density and corms size on saffron (Crocus sativus L.) corm production in nursery. In 4th International saffron symposium. 22-25 October 2012, Kashmir, India. De Iuan, J.A., Crcoles, H., Muoz, R.M., and Picornell, M.R. 2009. Yield and yield components o saffron under different cropping systems. Industrial Crops Production (30) 2: 212-219. Fernandez, J.A. 2011. The world saffron and crocus collection: strategies for establishment, management, characterization and utilization. Genetic Resources and Crop Evolution 58: 125-137. Galavi, M., Soloki, M., Mousavi, S.R., and Ziyaie, M. 2008. Effects of planting depth and soil summer temperature control on growth and yield of saffron (Crocus sativus L.). Asian Journal of Plant Science 7: 747-751. Ghobadi, F., Ghorbani Javid, M., and Sorooshzadeh, A. 2014. Effects of planting date and corm size on flower yield and physiological traits of saffron (Crocus sativus L.) under Varamin plain climatic conditions. Saffron Agronomy and Technology 2 (4): 265-276. (In Persian with English Summary). Gowhar, A., Nehvi, F.A., Ameeque, A., Naseeri, S., Iqbal, A., and Mand Sameer, S. 2012. Effect of corm size and weight on daughter corm formation in saffron (Crocus sativus L.). 4th International saffron symposium. 22-25 October 2012, Kashmir, India. Kafi, M. 2002. Saffron, Production and Processing. Ferdowsi University of Mashhad Press. (In Persian). Koocheki, A., and Seyyedi, S.M. 2015. Relationship between nitrogen and phosphorususe efficiency in saffron (Crocus sativus L.) as affected by mother corm size and fertilization. Industrial Crops and Production 71: 128–137. Koocheki, A., Ebrahimian, E., and Seyyedi, S.M. 2016. How irrigation rounds and mother corm size control saffron yield, quality, daughter corms behavior and phosphorus uptake. Scientia Horticulturae 213: 132-143. Koocheki, A., Seyyedi,, S.M., Azizi, H., and Shahriyari, R. 2014. The effect of mother corm size, organic fertilizers and micronutrient foliar application on corm yield and phosphorus uptake of saffron (Crocus sativus L.). Saffron Agronomy and Technology 2 (1): 3-17. (In Persian with English Summary). Koocheki, A.R., Siyahmarguii, A., Azizi, K., and Jahani, M. 2011. The effect of high density and depth of planting on agronomic characteristic of saffron (Crucus sativus L.) and corms behavior. Journal of Agroecology 3 (1): 36-49. (In Persian with English Summary). Molina, R.V., Valero, M., Navarro, Y., Garcia-Luis, A., and Guardiola, J.L. 2004. The effect of time of corm lifting and duration of incubation at inductive temperature on flowering in the saffron plant (Crocus sativus L.). Science Horticulturae 103: 79-91. Molina, R.V., Valero, M., Navarro, Y., Guardiola, J.L., and Garcia-Luis, A. 2005. Temperature effects on flower formation in saffron (Crocus sativus L.). Science Horticulturae 103: 361-379. Mollafilabi, A., Koocheki, A., Rezvani Moghaddam, P., and Nassiri Mahallati, M. 2013. Effect of plant density and corm weight on yield and yield components of saffron (Crocus sativus L.) under soil, hydroponic and plastic tunnel cultivation. Saffron Agronomy and Technology 1 (2): 14-28. (In Persian with English Summary). Naderi- Darbaghshahi, M.R., Khajeh-Bashi, S.M., Bani- Ateba, S.A.R., and Deh-Dashti, S.M. 2008. The effects of planting method, density and depth on yield and exploitation period of saffron field (Crocus sativus L.) in Isfahan. Seed and Plant Journal 24: 643-657. (In Persian). Nair, S.C., Kurumboor, S.K., and Hasegawa, J.H. 1995. Saffron chemoprevention in biology and medicine. A review. Cancer Biotherapy and Radiopharmaceuticals Journal 10 (4): 57-64. Nassiri Mahallati, M., Koocheki, A., Boroumand Rezazadeh, Z., and Tabrizi, L. 2007. Effects of corm size and storage period on allocation of assimilates in different parts of saffron plant (Crocus sativus L.). Journal of Field Crops Research 5 (1): 155-166. (In Persian with English Summary). Nasr Abadi, M. 2011. Effect of temperature in dormancy period, corm size and plant density on yield of flower and corm doughter in saffron. MSc Thesis, Faculty of Agriculture, Ferdowsi University of Mashhad, Iran. (In Persian with English Summary). Negbi, M. 1999. Saffron (Crocus sativus L.). Harwood Academic Publishers. Rahimi, H., Mokhtarian, A., Bazoobandi, M., Rahimi, H., Kiani, M., and Behdad, M. 2008. Effects of sowing depth and summer irrigation on Rhizoglyphus robini (Acari: Acaridae) population in Gonabad. Journal of Entomology and Phytopathology 76 (1): 1-14. (In Persian). Rezvani Moghaddam, P., Huda, A.K.S., Parvez, Q., and Koocheki, A.R. 2007. Indigenous knowledge in agriculture with particular reference to medicinal crop production in Khorasan, Iran. Managing Knowledge, Technology and Development in the Era of Information Revolution. Edited by A. Ahmed, p. 105-115. Sadeghi, B. 1993. Effect of Corm Weight on Flowering of Saffron. 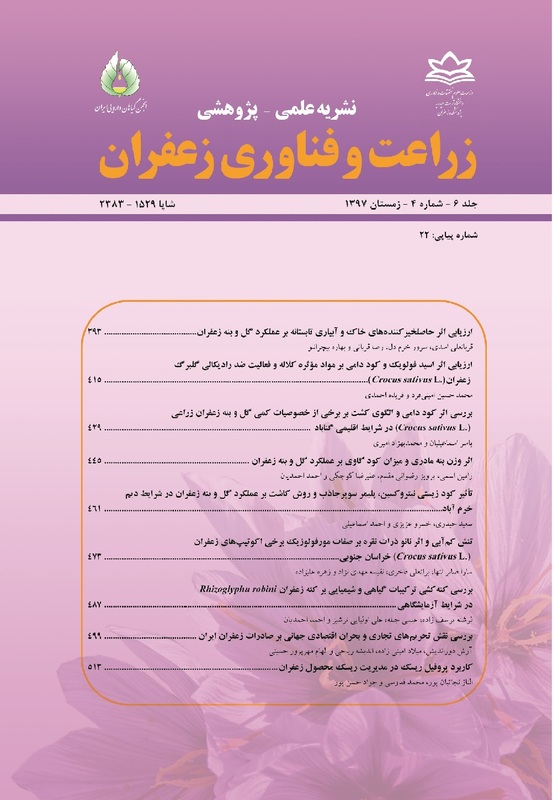 Research and industrial Institutes of Khorasan Publication, Iran. 73 p. (In Persian). Sadeghi, S.M., Dehnadi-Moghaddam, G., and Dooroodian, H. 2014. Evaluation of effects of date, depth and corm sowing distance on corms growth and stigma yield of saffron (Crocus sativus L.) in Langarood, Guilan province. Saffron Agronomy and Technology 3 (2): 137-144. (In Persian with English Summary). Sampatha, S.R., Shivashankar, S., Lewis, Y.S, and Wood, A.B. 1984. Saffron (Crocus sativus L.) cultivation, processing, chemistry and standardization. Journal of Food Science and Nutrition 20 (2): 123-157. Vafabakhsh, J., Ahmadiyan, J., and Mokhtariyan, A.A. 2009. Investigation of correlation between saffron flowering pattern and climatological parameters under planting depth and summer irrigation treatments. 3rd International Symposium on Saffron. Forthcoming Challenges in Cultivation, Research and Economics. 20-23 May 2009, Korokos, Kozani, Greece.